Now that weather and waters are warming, manatees are disbursing into their popular feeding and loafing areas. 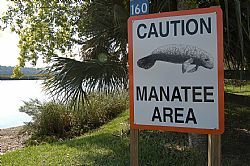 To ensure manatee safety, Florida Fish and Wildlife Conservation Commission (FWC) law enforcement officers, along with federal and local law enforcement partners, will be increasing patrols in these areas. This effort coincides with seasonal manatee zones that went into effect April 1 and run through Nov. 15. The speed zones are intended to protect the state’s official marine mammal from collisions with boats. Warming weather increases boat traffic too, which is why the FWC also reminds operators of boats and personal watercraft to slow down and watch out for manatees in springs, rivers and Atlantic and Gulf waters. The state’s lumbering “sea cows” are leaving the warmer enclaves such as freshwater springs, power plant outflows and canals, where they spent the winter, and migrating into more open waters. Wearing polarized sunglasses to help spot the creatures in the water. Watching for large, telltale circles on the water’s surface (manatee footprints) indicating the presence of manatees. Looking for a snout just above the surface. Slowing down when the presence of manatees is indicated. Boaters and others who find sick or injured manatees should report the animal and its location to the Wildlife Alert Hotline at 888-404-3922. For more information about Florida manatees, visit MyFWC.com/Manatee, where you can access the Boaters Guide To Living With Manatees brochure.